Back home, some of my friends don’t particularly like tofu and it’s hardly surprising as its crap; its expensive and sold in amounts not much bigger than a bar of soap. It’s never fresh, totally tasteless and apart from being packaged in cartons that don’t require storage in a refrigerator, I suspect it contains chemical preservatives. 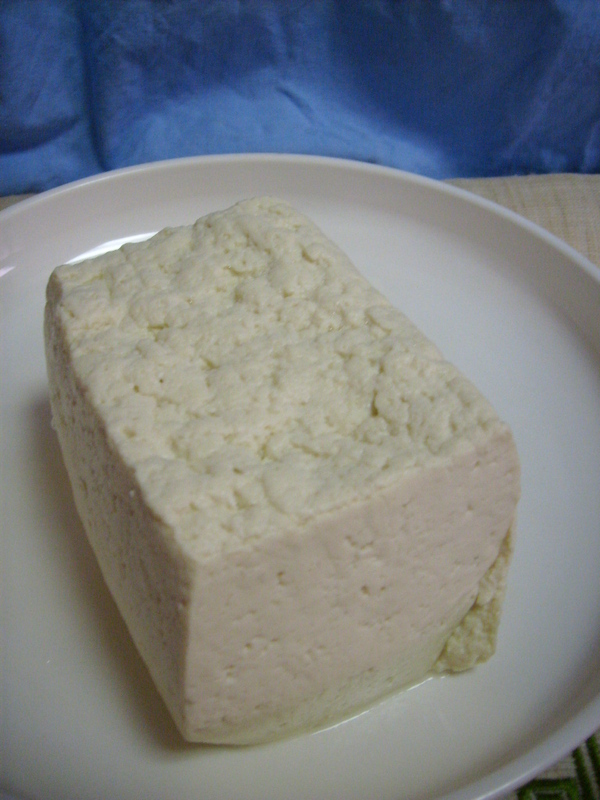 In Britain, tofu is about as oriental as a pizza in Korea, is Italian. This is quite natural of course, it is not a particularly popular food. Every Monday morning, I buy my tofu at the street market in Song-So. The block, which is about a third smaller than a house brick, costs 1000 Won (5o pence sterling), and it will last me a week used predominantly in soups. It is aslo very nice fried with sesame oil, sprinkled with sesame seeds and accompanied with a little soy sauce. The tofu is always warm when bought and indeed, when I sliced this cake to put in the fridge, it was still steaming. What I like most is the smell when warm, somewhat like steamed milk, but this is lost the moment it cools. Eaten warm it is pleasant though it’s hardly bursting with flavour. 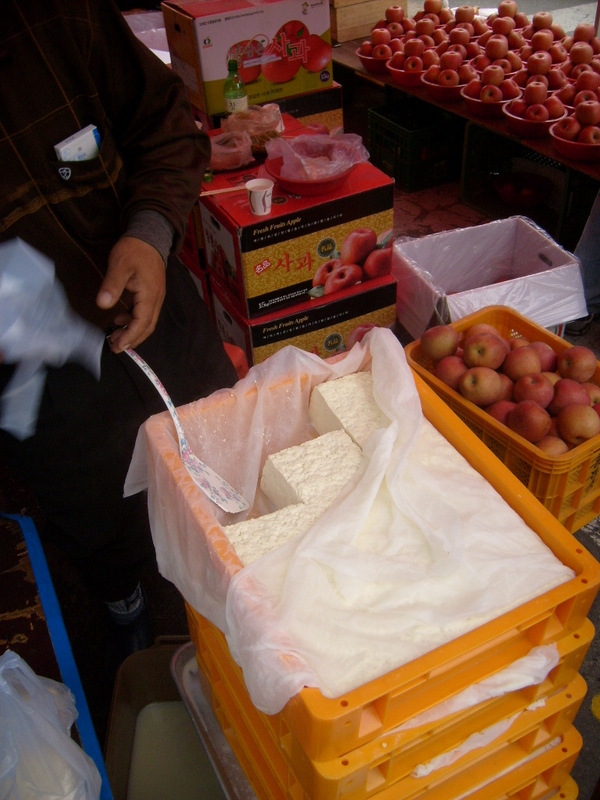 Like a number of other Korean foods, oak curd for example, (도투리 묵), I think the appeal lies in the texture and their combination with other textures and flavours. 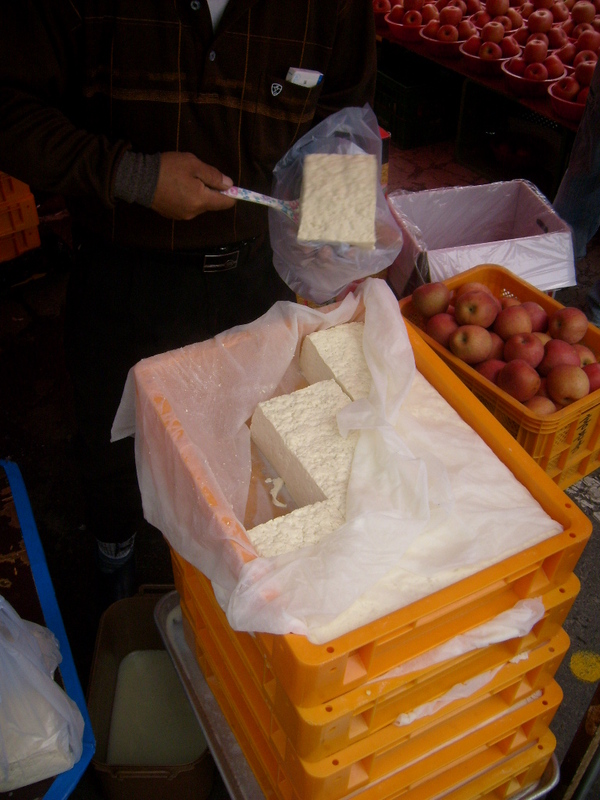 Tofu deteriorates very quickly if kept in the plastic bag in which it was bought. The best way to keep it is to place it in a plastic container filled with cold water. You can store this in the fridge and if you change the water every few days, it will easily last a week.